While visiting Rome this winter I had the opportunity to study several Vermeer paintings in the exhibit at the Quirinale. They were part of a larger show called “Vermeer and The Golden Age of Dutch Art” and although there were some other fine pieces in the exhibit, the Vermeers outshone the others. They seem to glow from within and the accuracy of the perceived space is extraordinary. Johannes Vermeer has captured modern interest not only for his dreamy women engaged in mundane tasks but also perhaps due to the mystery surrounding his life. We know little about his training, his personal life or his methods. I was intrigued by his use of the camera obscura, which seems to be an accepted fact among art historians, and I purchased a book which discussed his use of lenses, “Vermeer’s Camera” by Philip Steadman. This book suggests that Vermeer used a small booth type of camera which one sits in, and not the tabletop type. I felt Steadman’s work was intriguing and it raised some questions that I wanted to investigate. Advanced painters, those that have already done one semester with us, work on a project with me during the term. This spring I suggested we put our energies into discovering what makes Vermeer unique. His subject matter is neither original nor particular to him. His power lies in his method. We did some preliminary toying around with a magnifying glass and a black tent pitched over easels to get a sense of what a lens will do. When we determined that an image could indeed be projected by that means I took the time to build a small room out of PVC pipe and covered it in cardboard and black cloth. This served as our camera obscura. Procuring the lens was a bit more challenging but after some reading on the Internet I discovered that we needed a lens with a low number diopter and the local optician was kind enough to allow me to try many lenses until I found the one with the correct focal length. Once we had the lens and fixed it in place the next challenge was to see if the image could be traced easily and how one might go about painting on the tracing afterwards. 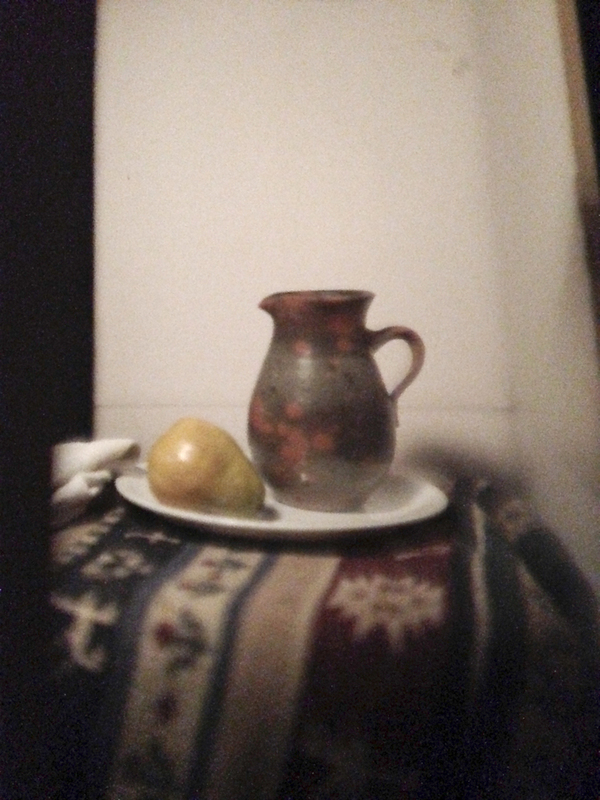 We set up the still life and used a mirror to reverse the image right to left because I thought we would need to see the real still life to paint from it at some point and the lens by itself reverses the image. This proved unnecessary but I didn’t know that at the time. We found that inside the booth we had a beautiful painterly projection and that the light coming from that was enough to see the palette and mix tones. Following traditional methodology we placed five tones directly onto the imprimatura, moving from the extremes of black and white and then locating the middle three. It was not difficult to find and apply the tones even though the image was in color but my advanced painters have had experience using the five tone range before. We took extra time to blend edges and smooth gradations. It is necessary to check your work against the projection occasionally which we do by turning on and off a light inside the booth. The extraordinary discovery was that a very credible image can be made, despite working in the semi darkness, despite working on a colored, upside down image, despite the lack of a preliminary tracing. I was thrilled to see the results, though each student had individual differences in handling and application, the paintings were all very beautiful, correct and nuanced. The next step was to add color once our underpaintings had dried. Again, working entirely inside the camera obscura, we mixed and applied color, both as glazes and as opaque paint. I am waiting for our group to finish this step and then I will report again on the results. The exhibit at the Quirinale was a chance to view paintings I may not get an opportunity to see again. There was also an obvious fake nestled in among the real work, something a trained eye could see. It will no doubt be bought by a major museum in the near future and pass into the oeuvre of Vermeer’s genius with an appropriate exchange of millions. But cynicism aside, the purpose of our exercise is not to make fake Vermeers. Sitting in the dark, seeing the painterly vision of light causes nearly all to exclaim at its beauty. We learn so much about color, surface, transitions of tone and application of paint following in the footsteps of this great artist. We have all gained immeasurably just by going through the process. … When Curiosity is the exploratory force behind all understanding, advancement, be it in art, the sciences, in life…. THIS IS SO COOL. Painters check this OUT! Jane Pack, your teaching methods amazed me every painting class and continue to do so even now. I am jealous of all your current students at The Aegean Center ! Miss you Jane, John, Jeffrey, Jun-Pierre, Gabriel. Fascinating Jane! Also makes me think about the literal but no so cliche connection between painting and photography 🙂 Can’t wait to read the update on this post. Miss you’ll. Hugs! Very fun! Nice to hear what you are up to! Jane I loved that project! and the work of the students is wonderful….your an amazing teacher! 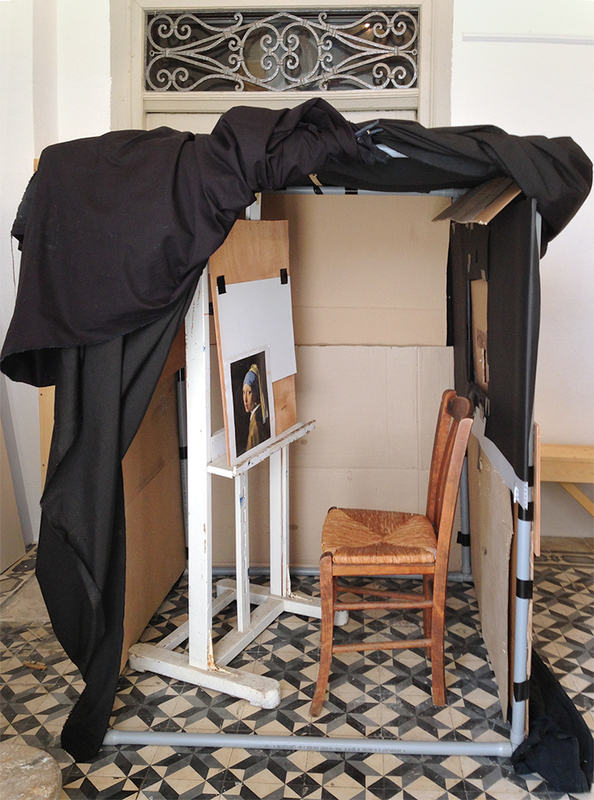 Have a look at my website http://www.printedlight.co.uk to see a way that Vermeer could have used the camera obscura in practice. This shows a method of transferring information from a projection to a canvas without the use of mirrors. The image is corrected in the process of transfer and the results have striking similarities to Vermeer’s own underpainting. I do not think that Vermeer would have painted in colour inside the camera, as it would have been impossible to judge colour differences in dim light, and the projection would have coloured his brush. However, if he had transferred information using a method like mine, he could do the remainder of his work on top of his underpainting in the light of his studio, facing his subject. You are currently reading The Vermeer Project at The Chronicle.